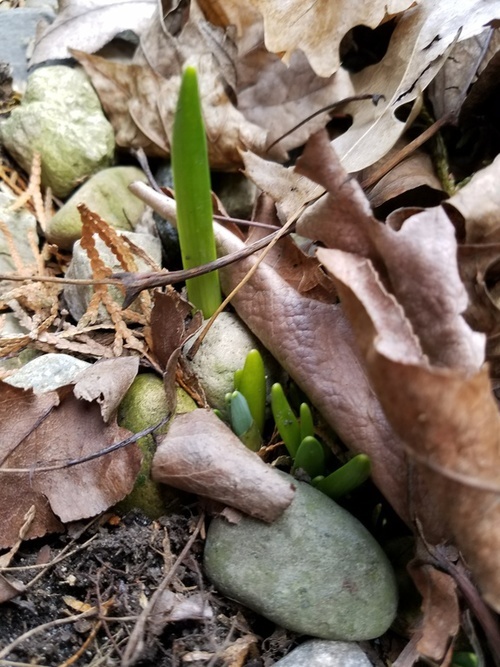 My Daffodils are peeking through, and I find myself eagerly awaiting the arrival of Spring! Yes, it will be weeks before these babies bloom and the temperatures stay consistently warm, but now that I see progress, it’s easier to be patient. I found the following quote in a publication I was reading and decided it was appropriate for ALL of us (but especially those of us trying to write a book!) Have a beautiful Sunday, my friends! This entry was posted in Seasonal and tagged daffodils, patience, spring. Bookmark the permalink. I’m so glad you have that sign of spring, Debbie. You’re right — it is easier to be patient when progress can be seen. And it can be hard, sometimes, not to confuse mistakes with the normal limitations of life. It’s easy to think, “I should have done better,” when in fact, we did quite well. Thanks, Linda. Our ground is finally free of snow, but the cold remains. We know Spring is on the way — eight more days now! — but Spring here is different from Spring in the south. It’s really a roller-coaster ride here, and there’s little to be done but hang on. Eventually, things will level off! Beeeeautiful photograph, Debbie! It’s so crystal clear! I know can you believe it? Spring is just around the corner. I can’t wait until all the flowers and trees start blossoming. LOVE the quote you shared. In fact, I read it twice! Amen! We all make mistakes, but even mistakes have value if we learn from them. I love that quote, too, Ron. Many of us are unreasonably harsh judges — both of ourselves and of others. We can learn a lot by cutting ourselves some slack, then granting that to those around us. Spring officially arrives on March 20 — next week!! I know it won’t appear all at once, but how I’m looking forward to warmer days and the return of flowering green things! Excellent passage, Debbie. I know we all tend to beat ourselves up when things don’t go well. Being worthwhile and recognizing ourselves as such is a blessing. Thanks, John. Some of us have really high expectations. That’s a double-edged sword: good if it causes us to try harder, but not-so-good if it masks our pleasure in small accomplishments. We’d all do well to remember, Nobody’s perfect! Hi Debbie, thanks for this timely reminder to be patient especially with ourselves and remain hopeful for spring. Love the photo and the quote. I needed to hear this as we await our third nor’easter in less than two weeks! Aw, Kathy, I just know you’re tired of winter weather that keeps beating down your part of the world! Our snow has melted, but it’s still cold. And gray. Trying to look on the bright side, the birds are chirping and I’m not outside shoveling snow, ha! Stay safe out there, and thanks for dropping by! Thank you, FF! I meant to dig these bulbs up and move them to a better location, but as you see, I didn’t. Now that they’re peeking through, I don’t dare mess with them. I guess I need to set a reminder on my phone to re-plant them after they’ve bloomed. I’m so eager for spring — seems like this winter has hung around far too long. I can’t wait for your spring flower pictures. This is just the beginning! Tanya, I can’t wait for the weather to get warm enough for something to bloom! I keep looking for signs that spring is on its way. They’re few and far between right now, but some of the stores are getting in huge pallets of potting soil and such, so somebody’s getting ready. Well more snow on the way…spring postponed!